A cat is recovering at the Blue Cross animal hospital in Victoria, London, UK, after she was spotted perilously perched on barriers along the Hammersmith Flyover in West London. Nearby office workers from lettings agency Folio London, part of Notting Hill Housing, saw the terrified cat about to fall from the elevated section of the busy London artery after she was unable to escape from the traffic rushing past her. 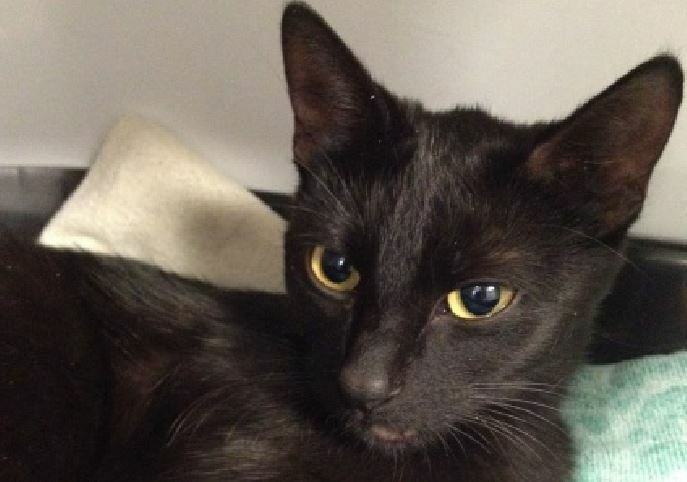 Rescuers fear she may have been deliberately thrown onto the dual carriageway from a car. Leon Gaskin led a team of co-workers, Sara Persad and Breda O’ Mahony, armed with just a towel and cardboard box. They drove on to the bridge, quickly pulled in and managed to get her into the box, before taking her to the leading pet charity’s animal hospital. Blue Cross pet charity vets have named her ‘Bridget’ after where she was rescued from. She has been treated for a grazed and bloodied chin, but is fortunately well enough to be discharged soon. The office workers filmed their colleagues making the rescue and can be heard cheering the happy result on the video. Beautiful accents those women have… wonderful save, but still I wonder what kind of person could’ve done that to that pritty black kitty. Happy day for you, kitty.